Now that warmer weather has arrived, chances are you’ve caught the smell of burgers on the grill wafting through your neighborhood. One of the positives of the weather in the Midwest is that for the better part of three seasons, we can grill out. Nothing tastes quite as delicious as burgers, hot dogs, and steaks on the grill. While you may be familiar with the use of propane for grilling, it’s also possible to use propane for cooking year-round. Many households use propane as a primary source for heating and cooking – over 12 million of them in the United States alone. Propane is used to provide the energy needed to operate furnaces, heat water, and fuel appliances such as stoves. The advantages of cooking with propane in the home are many. 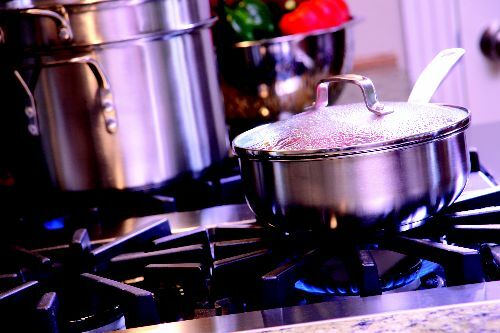 Gas provides a more even heat across the bottom of pans and within the oven, and gas burners can more easily accommodate pans with dented or warped bottoms. What’s more, gas burners respond instantly with heat, while electric elements require time to heat to the required temperature. Operating costs for cooking with propane are more economical over electricity, as well. On average, cooking with propane is half the cost of cooking with electricity, and pilotless ignitions on propane stoves save up to 40% overall in energy usage by eliminating the need for a constant pilot light. Propane appliances are available in many different forms, including convection ovens, griddles, grill tops, and deep fryers. Perhaps best of all, propane appliances with non-electronic ignition sources (aka constant pilot lights) are unaffected by power outages, meaning during an extreme weather event, it’s still possible to have a hot meal. Still, the most popular use of propane for cooking is the home barbecue grill, which is usually powered by the little white 20-pound propane tanks so readily available at many retail locations. Because of propane’s ease of portability, a propane-powered gas grill can be used at home, while camping, and even for tailgating – anywhere you can take your grill. Cylinder exchange programs can be found virtually everywhere, allowing consumers to swap empty tanks for filled ones as needed. Perhaps the least-known but most appreciated use of propane for cooking is at the many street festivals in the area. Lin-Gas provides propane for the venerable West Side Nut Club Fall Festival in Evansville, IN every year. If you’ve had an elephant ear or brain sandwich, you’ve enjoyed one of the biggest benefits that propane-powered cooking can offer. We’ll tell you a bit more about our role as a supplier to the Fall Festival in a future blog as the date gets closer. Until then, you’ll have be content with dreaming about that tasty brain sandwich until festival time arrives again.